I love today's film simply because it shows you that life is worth living to the fullest despite the odds. 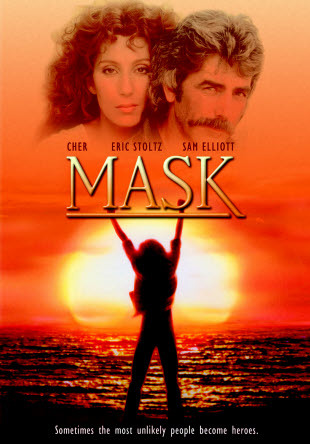 Mask is the 1985 film based on the real life of Roy L. "Rocky" Denis a young teen who suffered from craniodiaphyseal dysplasia, a very rare disorder commonly known as Iionitis. Directed by Peter Bogdanovich, starring Cher, Sam Elliott, and Eric Stoltz with supporting roles done by Dennis Burkley, Laura Dern, Estelle Getty, and Richard Dysart.